Book an appointment for a facial! EVERY town has a professinal Esthetician/Beauty Therapist and or spa who offers this service. I often hear a facial is just fluff and pampering. Those words drives me crazy! That is not what we only do we make you LOOK good and your face feel amazing too.It’s like a dental hygenist cleans your teeth but for your face. You know that fabulous feeling your teeth and mouth feel like after thye are cleaned. You will really notice a difference in your complexion. I love to get a Deep Cleansing Facial which also includes a mini massage and a heated hand or bottie treatment. They all relax your body, mind and spirit. I get a facial every month all over the country in my travels. I do this to supplement my morning and evening cleansing beauty routine. They work hand in hand. It is an amazing service and I truly think necessary for healthy happy skin. During the facial they will do an array of steps and the one photographed is using an anti-aging Asian skin smoothing face and eye roller. 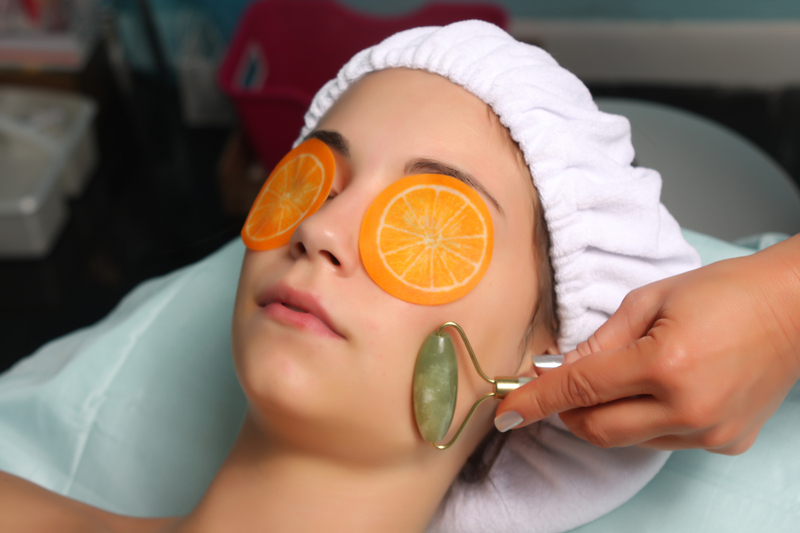 Facials come with all kinds of ingredients, diamonds,gold leaf and so much more.Now is the time to explore!See what you have been missing and book an appointment for this fabulous skin treat. You will LOVE THE WAY YOUR SKIN will look. Take care of yourself if you don’t who will take care of you?